A perfect day for running, as has come to be expected in the shadow of Slieve Patrick around this time every November, when Saul GAC temporarily suspend their involvement in gaelic games and take to the roads Round the Griddle writes Joe Quinn. East Down AC runner Liam Venney wins the Saul Gridle 10K. Not that a lot of them take part mind you, as most hide behind the team manager’s directive as is common elsewhere, not to participate in a 10K road race in case of damage to tender limbs. I reckon that any footballer worth his salt and indeed his place in the team should be capable of running that distance comfortably in close to 40 minutes, without raising too much of a sweat, and still be able to complete the second half too! The winner of the 5K race, which is actually 6K, was Saul GAC member Tom Burns who put his senior colleagues to shame, coming home 7 seconds clear of Caolan Magee with East Down’s Aoife Cochrane relishing the step up in distance and showing a clean pair of heels to her clubmates, to take the first female spot ahead of Elisha Surginor. Other notable performances in the race was the Byrne family who were only separated by seconds as they crossed the line with James just sprinting away at the finish, and Miya-Rois Gaffney, all 9 years of her, scampering home well clear of her Dad. Last year Aoife’s Mum Oonagh and Sharon Carew took part in this race as their first outing in a competitive event since when they have completed Full and half marathons respectively. Not bad progress in a year? The 10K race was dominated from the off and won in fine style by Liam Venney in 33.19, almost 3 minutes ahead of Seamus Lynch with Newcastle’s Brendan Quail in 3rd. 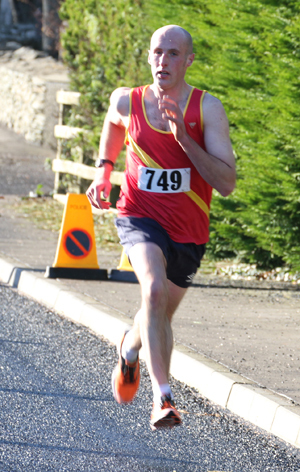 Other notable performances came from Declan Teague 39.10 who knocked over 4 minutes of last year’s time and Michael Cultra 40.39 who cut his by 45 seconds. Saul’s J P Burke 40.06 just missed breaking 40 minutes but must be pleased with taking 3.51 off his 2011 time. An improved time too by Stephen Heasley 43.07 and a good debut in East Down colours for Dermot Cahill 44.14, with Richard Gill 47.36 also attracting the attention of the handicapper with an almost 3 minute improvement. Another local Michael McCreesh 55.33 continues to inspire as he makes steady progress. The juniors head off on the 5K leg of the Saul Griddle. Further back Sharon Carew, opting for the longer distance this year, led home two of East Down’s growing band of coaches Roisin Gaffney and Deirdre Mount just behind soon to become club colleague Cathy Burke 55.20. East Down won both the athletic club team events with Saul GAC winning both Non-Athletic club team trophies. 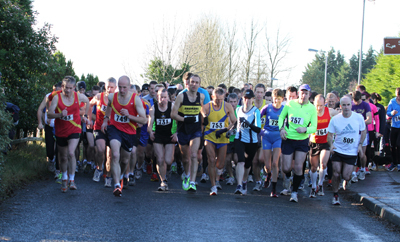 Senior runners set off on the Saul Griddle 10K. A memorable day ended in the convivial atmosphere of the Community Hall where a veritable feast of food, drink and fruit was laid on by the hard working Ladies, Well Done to them. A little further south, East Down had 3 representatives in the Co. Down team which contested the inter county cross country championships in Ratoath Co. Meath on Sunday. Brendan Teer placed 40th , Neil McCartan 76th , Barrrie Atkinson 118th and aided by Newcastle’s Barrie Donnelly 125th and Mark Kendal’s 127th to help take 10th place in a highly competitive field. At the same venue Caoilin Quinn ran well in the soft muddy conditions to finish 112th in the almost 200 runner Under 12 Boys All Ireland Championships. In the Under 16 Girls race Ellen Erskine gave a good account of herself and kept the Club colours flying with an excellent 52nd place. 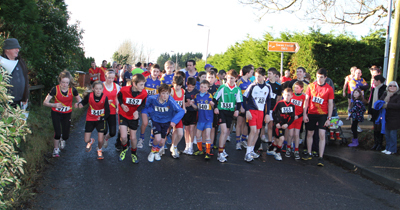 Next week the action switches back to Ballyclare with round 3 of the Cross Country League in the Malcolm Cup races.